Sybil Runs Things: A florist? Who, ME?!?! My lovely sister-in-law has asked me to make her and the bridal party's bouquets to carry during the wedding in two weeks. I am very excited to help, but ZOINKS!, I've never done this before! 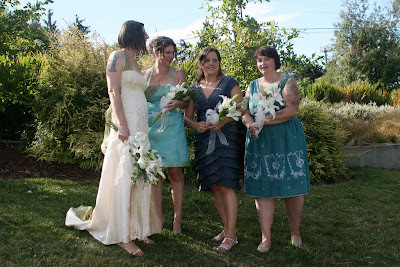 Well, once I sort of did, for my friend's wedding a looooong time ago. It was low-key affair, though. In the back yard under a rented white and yellow striped tent. The poles were set up in the middle of the aisle, and my friend is now divorced. Oh, right, back to SIL's wedding . . . So I offered to do this. I will be hitting up the farmer's market tomorrow to get some idea of what flowers are in season and also to buy a few things to practice making bouquets with. I will also be making boutonnieres and maybe something for the mother's of the bride and groom. I'll have to ask. I think I will do something like that, more loose and forgiving, rather than one of those really tight and poofy bouquets. Anyways, their colors are peacock blue, bordeaux and silver. I am not really sure what colors to match with that, other than maybe doing all white bouquets like we did at my wedding. Any suggestions? my mom did most of my wedding flowers. We did simple hand wrapped bunches of mini calla lilies and they looked stunning. Good for you taking up the challenge, I'm sure it will be beautiful!